Asian markets were in a sea of red amid signs of U.S. economic sluggishness and escalating worries about Europe's sovereign debt crisis after Italy and Greece were slapped with credit downgrades. Commodities prices also slumped as the greenback strengthened, as well as signs of worldwide slowdown in economic growth, manifested in slumping markets and rising inflation rates. Major losers were Vietnam (-3.5%), SHCOMP (-2.9%), KOSPI (-2.6%), JCI (-2.4%) and HSI (-2.1%). In line with the regional declines, FBM KLCI tumbled 12 points or 0.8% to 1529, led by MISC (-34sen to RM6.69), IOICORP (-8sen to RM5.23), MAYBANK (-7sen to RM8.80), GENTING (-12sen to RM11.06) and AMMB (-11sen to RM6.40). Market breadth was negative with 175 gainers as compared to 630 losers. FBM KLCI near term outlook is cloudy due to the external uncertainties as markets are going through "a global correction" because of slowing growth in China, the contraction in Japan's economy and Europe's debt problems. 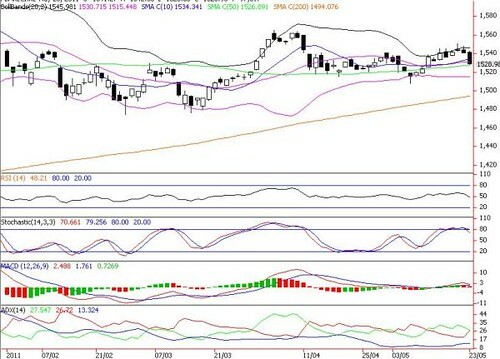 Given the extended fall on Dow overnight and the deteriorating technical indicators following the 12-point slump yesterday, the local bourse is likely to extend its downside consolidation for a while. Immediate upside resistance levels are 1546 (upper Bollinger band), 1552 (23.6% FR) and 1565 (5 April high). With the sharp decline yesterday, support levels are now 1525 (50% FR) and 1515 (lower Bollinger band). More solid supports can be established at 1507 (6 May low) and 1500 points.